Home > Newsletter > 2018 > Week 25 (2018) – How wrong can experts be? Week 25 (2018) – How wrong can experts be? How wrong can ‘experts’ be? According to figures from Public Health England (PHE), children in England have consumed more than a year’s worth of sugar in less than six months. Children aged four to ten years should have no more than the equivalent of five–six cubes of sugar per day, but are consuming on average 13 cubes. This means they are on track to consume around 4,800 cubes of sugar by the end of the year – more than double the maximum recommendation. (They are not even counting the sugar in carbohydrates, dairy products and high sugar fruits, which will more than double this sugar intake). It’s a good job I have a strong heart from not consuming sugar – otherwise this crazy statement would have given me a heart attack. There is no healthy level of sugar. Sugar has no nutritional benefits except in a medical emergency situation. Compared to smoking raw organic rollup tobacco, sugar is many times worse at causing disease (I don’t recommend doing this either). For clarity, it is processed, chemically added, manufactured cigarettes that are also a serious cause of diseases…but even this type does not cause as many diseases as sugar. The ‘experts’ don’t recommend a maximum level of tobacco…so why recommend a maximum level of sugar? Are they industry biased or are they suffering from an overdose of sugar themselves? Like alcohol, we know that too much sugar turns the brain to mush and eventually causes most forms of dementia. Bread, sugary soft drinks, standard ice cream, fruit juice, energy drinks, cola, fizzy drinks, bread buns, cakes, pastries, fruit pies, preserves, sweet spreads, biscuits, breakfast cereals, chocolate confectionery, sugar confectionery, yogurt, other dairy desserts, ice cream and puddings…remain the main contributors of free sugars to children’s diets and ultimately increase the risk of disease. Fruit juice, diluted with water and no added sugar may be a healthier alternative to soft drinks. It may still deliver a large amount of sugar to children’s diets when consumed in large amounts. Sugar can lead to infections, weight gain, obesity and tooth decay even at an early age. Later on it also increases their risk of preventable health conditions including type 2 diabetes, heart disease and some cancers. It’s no more difficult to stop the addiction to sugar than it is to tobacco, alcohol, cocaine, or gambling. You first have to recognise you have an addiction – recognise the damage it is doing to you and your children and then use your human willpower to decide to stop (or at least limit to a safer level) the addiction. This formula can help you calculate how much sugar your body takes in daily. Paying attention to sugar and carbohydrate content makes it easier to maintain a healthy weight. Remember sugar/carb consumption only makes you fat and although you need a little fat, it is muscle you need for good health. The truth is that we only require an equivalent of 12 teaspoons of sugar, or 60g of carbohydrates, a day. Compare this to the 60 or 70g of sugar consumed in the typical diet. What a difference! It’s essential to remember that 5g of carbohydrates converts to 1 teaspoon of sugar. If you think you are avoiding unnecessary sugar by cutting out candy and cookies, think again. Eating a large bagel meets your sugar requirement for the day at 12 teaspoons of sugar. This is precisely why starchy carbohydrates should be limited. If you have never taken the time to examine sugar and carbohydrates in your diet, you may be shocked. You may be eating what many consider a healthy diet, but refined or empty carbohydrates are filling your body full of unnecessary sugar that can quickly lead to toxicity. This is the ultimate sugar trap. It’s clear to see that high sugar carbohydrates in the diet should be avoided. This includes processed foods, white rice, potatoes, pastas, breads, cereals, soft drinks, and pastries. If You Can’t Eat Sugar, What Can You Eat? There is no reason to feel deprived as you regulate your sugar intake. Cutting unnecessary sugar and carbohydrates holds the key to your health. High-sugar, high-carb foods are inflammatory. Inflammation is one of the top causes of disease in the Western world. Cut out starchy carbs – pastries, cookies, cereals, white rice, potatoes, breads, and pasta. Cut out processed foods and dairy products. Eat 14 small portions of veggies a day. Eat 3-5 portions of beans, nuts, and seeds a day – soaked, mashed nuts and seeds. Eat 3-5 portions of dark-skinned fruits – a minimum of 2 avocados a day. Add healthy oils to your diet – omega 3, hemp, krill, and olive oil. Processed, high-sugar, high-carb foods are a Western epidemic (not spreading to eastern countries). Many times, the medical community cannot find a cure. Diet is ignored completely or used as a last resort to address chronic health issues. It’s time to eliminate excess sugar from your diet before it’s too late. Sugary foods are high on the glycemic index, which means that high-sugar foods cause a spike in blood sugar levels. When you eat a sugary bowl of cereal, for example, it will quickly raise your blood sugar. This is compared to eating an alternative grain like quinoa that will raise blood sugar slowly without a crash. High blood sugar levels caused by junk foods have been linked to countless chronic diseases. Once sugar enters your digestive system, it feeds unhealthy, pathogenic gut bacteria. An excess of sugar from high-carb foods can cause illness due to an imbalance of bacteria in the digestive tract. Last but not least, processed, sugary foods are completely devoid of nutrients. Eating a sugary snack instead of a fruit or vegetable won’t do you any favours. Fruits and vegetables are rich in antioxidants, vitamins, minerals, and phytochemicals. Processed snacks feed inflammation in the body with a quick overload of sugar. Won’t you join with us to spread the message of the dangers of sugar toxicity? Most people reach for high-sugar, high-carb foods without a second thought. Over the long-term, this bad habit can literally destroy life. Natural, healthy foods are the answer to combat a high sugar diet. Avoid sugar toxicity and chronic disease by limiting your sugar intake to 12 teaspoons a day. The solution: 10-20 minutes before eating (not later) is taking a supplement that helps reduce blood sugar levels and absorption. The moral of the story is to mitigate the damage that sugar does to the body. This is by either stopping or spending money on this supplement. 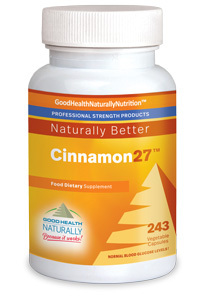 Cinnamon27™ – Designed to support blood sugar levels, Cinnamon has been shown in studies to stimulate insulin receptors and block the enzyme that interrupts them. Cinnamon27™ is a blend of six proven extracts including Cinnamon bark extract (made from Ceylon), Gymnema Sylvestre extract, Bitter Melon extract, Fenugreek seed extract, Coral Minerals, American Ginseng Root extract and Nopal Cactus (prickly pear) extract.